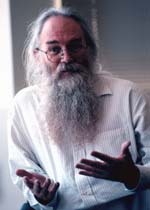 I love Jon Postel because of his Robustness Principle and how it can be applied far and wide from the confines of computer science. All great truth finds wide application! Also he had a flowing beard and wore sandals and was the ultimate editor of technology. Yes, I am weird and read RFCs for fun. Jon's RFCs were the best - pure poetry! The Internet works because Jon Postel wouldn't let it do anything less. He was a model for the benevolent dictator and knew what a good God should be about!